Back from Vacation! Hello November! I've been working on this bouquet for the longest time, in between custom orders and sorting through some postal issues that came up. I'm glad I found a solution moving forward for future packages, and finished this miniature bouquet. I started some of these flowers before I left for my holidays, and had to pick up the momentum after I came back. The colors weren't fixed then, but I knew I wanted to make a bold, bright colored bouquet. Many hours later, I present you "Color Burst". The veritable explosion of colors found in this bouquet is designed to light your eyes up when you see them in real person. I found myself drawn to the deep dark purples, then to the bright yellows, vibrant reds, dancing oranges and couldn't decide which were my favorite colors. Bright colors are known to make one feel more energetic, happy and positive. Do you know of anyone around you who needs some bright colors? I'll need to work on my next bouquet. So many colors, but perhaps I shall make something more festive..We'll see. I hope you had a wonderful time with your family and loved ones. 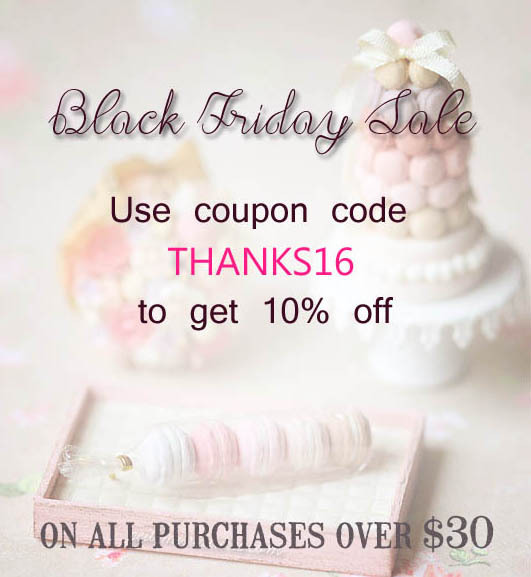 And as usual, after Thanksgiving, Black Friday Sale is here! I am also offering a coupon code for my Etsy shop here. Last night, I had to do a little experiment in preparation for another workshop this coming weekend. It happens. Sometimes I face a situation whereby a product that I use is discontinued and I can no longer find that available. So it's either I find a replacement or find a new method. And yesterday, I found a new method to make the dollhouse miniature creme brulee looking realistic. Before I started my experiment, I had to find a miniature cup. I decided to use whatever I had on hand, that isn't plastic for this experiment. I used a UV resin cup that I made myself using this miniature cup mold sometime ago for this experiment. Then I started my experiment. I was thrilled with my result! Very very pleased that I could find another way to do what I needed to do, even when a supply is no longer made available. Will be a fun class this weekend! There are some new miniature words, and some old ones too. What are some other words that you would like to see to be made into dollhouse miniatures? Not all can be done, as there are still technical constraints to this. Dream was, surprisingly very popular in the last round. Fleur was something I also included in the last round, but this time round, I also made it into another typefont. It looks nice. This is slightly bigger. A side by side comparison of the 2 "Fleur" sizes. I wanted to blog about this, as there is very little information or photos found on the internet when it comes to special dietary meals on airplanes. What is actually being served when you order special meals on the airplane is somewhat a mystery, especially if you order something more unusual besides the vegetarian meals. But just to give you a little context. I was very lucky to experience one of the longest flights ever to visit my friend. We had to fly from Singapore to Dubai for 6 hours, and then Dubai to Los Angeles. Flight time was 16 hours 15 mins on this leg alone. Then from Los Angeles to Seattle for 2 hours. But the silver lining to this long distance traveling was that I was also going to fly in Business Class together with my mom. (Thanks to my wonderful friend who gifted me with award travel on Business Class) My priority on these flights was ensuring that my mom would be able to have something to eat that doesn't clash with her medication. She couldn't eat cheese as that would interfere with her medication, and we don't eat beef and mutton as well. The good thing about flying Emirates is that they publish their meals on the website before the actual flight date, so you can take a look at what will be served. After studying all the food options, I realized that almost every choice had cheese in it, and there were a lot of beef and mutton options in the particular flight we were in to Los Angeles. That left me with no choice but to order special meals for both of us. The Low Fat/ Low Cholesterol Meal (LFML) seems to be the safest choice for us. On the Emirates website, there were no pictures, so this is all the information you've got. It contains one or more of these ingredients: margarine, cottage cheese, egg whites, boiled rice, potatoes, lean meats, fish, wholegrain bread, cereals, and fresh fruit. It does NOT contain milk, cream, fat, cheese, egg yolks, or fatty meats. My search results came up with photos of LFML meals in economy class, which was still helpful in a way. I was hoping we would get something similar to what was being served in economy class. So I thought it would be a good to take photographs of what does a Low Fat/Low Cholesterol meal consists of in Business Class. Our flight from Dubai to Los Angeles started off in the morning around 8ish. We would be served breakfast first shortly after take off. Of course, who could resist the pre-departure drink? I picked orange juice, as I haven't had a lot of sleep the night before in the business lounge, so I was careful of not consuming too much alcohol and caffeine. I love my window seat! I got a window seat for both Mom and myself. Mom loved it. :) The air stewardesses were very nice and thought we would want to sit together. She was going to arrange something for us. In reality, the flight was less than half full, so we could pick and choose to sit anywhere we wanted that wasn't occupied. Another view of my pre-departure drink. :) Time seem to fly so quickly when you're busy looking around the cabin, and figuring out buttons on your seat. There was a lot of leg room for me. My legs could barely touch the leg rest area, unless I use the seat control buttons to recline my seat. So, here's what my Low Fat/ Low Cholesterol Meal (LFML) Breakfast meal in Business Class looks like. I absolutely loved this, and I finished everything you see on there. In fact, the air stewardess would walk around with the bread tray and asked if you want more bread. I DID get a second croissant. It was delicious. In the mains, there were eggs, potato, mushroom, tomato and spinach. It was very delicious. But I really want to rave about the fruits. I knew in the other breakfast selection, you would get the usual fruits like watermelon, honeydew, apple, orange etc. For ours, they gave us pink grapefruit, oranges and some berries. It was served chilled, and was very very sweet. Both Mom and myself were talking how fresh and sweet the fruits were non-stop. That's how good it was. Memorable. I remembered sleeping for a few hours after eating a heavy breakfast. I woke up to a dark cabin, and was feeling a little peckish. There were a few snack options I could select from the menu. I picked the sweet option as the hot snack options were not that appetizing to me. This was a vanilla dome dessert. Inside it was raspberry coulis. It reminded me of the miniature dome desserts that I was working on prior to taking my holiday :) I also ordered Camomile Tea. About 2 and a half hours before reaching our destination, lunch was served. This is our starter. A very healthy salad with lots of mixed vegetables. On the starter plate, we had lobster, and some seafood thingy, which I wasn't sure what it was. I skipped that one, but ate the lobster. It was fresh and sweet. Overall, I was very pleased with the meals and service on Emirates. There were many air stewardesses on board to take care of all of us. 15 hours didn't seem so long on the air to me. I slept on and off, usually 2 hours at a stretch, watched a few movies, chat with my mom, walked around, snacked on warm nuts, drank a lot of water and juices and just enjoyed ourselves. From time to time, I get requests to customize a color of something I offer in my shop. And earlier, I got a request from my customer to make a pink clay rose ring based on what she saw in my shop. I made a white clay rose ring earlier, and it sparked an idea for her and so she wanted a 2 tone pink clay rose ring. I couldn't pass up the chance to create the 2 tone pink clay rose ring! Just love the colors! I made the 2 tones very subtle, just like what was shown in the photo. It doesn't show up very clearly here, but it is actually 2 tones. I was glad to make it to the #EtsyMeetsSingapore Sellers Meetup event yesterday! It was time well spent. Even though I have been selling on etsy for a while now, anything that has to do with technology changes all the time. Although the turn out yesterday was small, but I thought it was still nice and cozy. I am grateful for the organizers who put it all together. They had a couple of topics on "social media" and "keywords" that I found relevant and useful. So even for long time sellers, I think one would pick up something that they didn't know. At least I did! It was also nice to meet other sellers, although I must say I didn't get to talk to many. I tend to talk "deeply" with each one, and before we know it, break time is up! :) A shout out to Janice of TrinketsEtcetera It was great chatting with you! :) I think she will be opening up her store or another one soon. There were also potential shop owners. I met a dad who drove his daughter and wife to this event. We had a short, interesting casual chat. I hope his wife and daughter will feel inspire to open up their shop after the event yesterday. We got a note pad, pen and notes from yesterday's event. There were some stickers too. A light-bulb moment for me yesterday was knowing who my target audience is. I only knew it instinctively yesterday. For many years, I have been thinking about it and if you asked me a few years ago, I couldn't even really tell you exactly tell you much. But when this question came up yesterday, a very precise answer came into my mind. And I knew this after having deep conversations with a few of my lovely customers who have spend time chatting with me online. We'd talk about not just what I make or sell, but what interests us, what makes us happy. These are good questions and it gives you an insight into another person's life. So, thank you, for those of you who have shared with me your life, your likes, what inspires you! I'm back from my vacation last week and was slowly getting back into the swing of things! I wanted to put a list of key highlights of my trip quickly, because I haven't had time to get all the travel photos together. Also, it will help me to remember my trip as time goes by. * I met my long time friend of over 10 years. Not many people can say that, and I feel very grateful. * I get to hang out with my best friend, and we spent time just hanging out. * I got to experience fall/autumn again, and love this beautiful season. I saw so many beautiful trees and leaves of many colors. It was breathtaking. * More than 10 years ago, I passed by the Art Gallery and had wanted to visit it, but never had the courage to do that. Finally, I went to the Art Gallery and loved it. * I got to experience several walking trails, all of them were beautiful. Abundance of nature makes me really happy. * I bonded quickly with Coco, a bulldog. She's the sweetest and most affectionate dog I've interacted. My friend and I were equally surprised how quickly I learnt to lead her with ease. She loves my massages. * I got to carve my first Jack O Lantern pumpkin, which I'm really happy and grateful for that experience. The pumpkin only costs CAD$3. * We dug the seeds out from the pumpkin and roasted them to eat. It was delicious. * The weather was kind to us mostly, and I got to see both cities on good sunshine days. * Customs was a breeze, never had problems at both countries. * We didn't have any jet lag when we arrived and when we came back! * Best bud insisted that we were lucky people, as the rain stops and the sun appears whenever we had to go into the outdoors. * I realized that a lot of things were actually cheaper in Canada than compared to back home. I worked on these American girl doll chocolate dome desserts as soon as I came home, and am glad they are completed and mailed to my customer. I had another new dome dessert idea while working on these, and I'd like to see them in fruition soon.